Cork Titanic Society planning to erect ‘Lost at Sea’ Memorial. CORK Titanic Society is planning to erect a ‘Lost at Sea’ memorial in the inner harbour and is holding its annual commemoration for same at 12.15am Mass in the Church of the Holy Cross, Mahon, in Cork Harbour on Sunday, May 31, to which everyone is welcome. 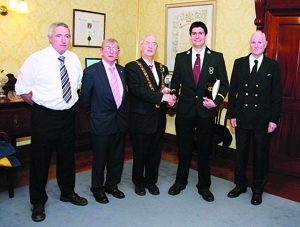 Details were outlined at a reception recently in City Hall attended by commander of the society, Frank O’Sullivan; his father, chairman and co-founder Tim O’Sullivan, Farranree; Basil Switzer and society president and city councillor Dave McCarthy. Lord Mayor of Cork Brian Bermingham paid tribute to Cork Titanic Society for its voluntary work and voiced support for its memorial plan which will remember people who not only died at sea but also in inland waterways. It’s likely the stone memorial will be erected at the Marina where the River Lee meets the harbour but other locations are still being considered. Tim O’Sullivan recalled how the society was born 13 years ago in Farranree, Cork, after local priest Fr. Aidan O’Driscoll suggested that a large-scale model of the ill-fated liner Titanic made by Tim and his brother Florence should go on public display and help raise funds for a deserving cause. Base, Haulbowline, followed by the placing of a wreath into the harbour. Further models of the Lusitania, Innisfallen and sailing ships have been crafted by members of the Society and are on display in the West Cork Heritage Centre in Bandon, the Naval Base, Haulbowline; the National Maritime College of Ireland, Ringaskiddy; Mount Juliet Golf Club in Co. Kilkenny, the former Farranferris College and Cobh Museum in the old Scots church. The Society is also endeavouring to have a maritime museum in Cork. Frank O’Sullivan said the society had, over the years raised funds for Diabetes Ireland, Cork Simon and other worthy causes, and helped provide a boat for a family stricken by the Tsunami in Sri Lanka and an RNLI lifeboat for Crosshaven. This was achieved through exhibitions, church gate collections, a Jack Lynch Tunnel walk and grocery packing. It has also organised a maritime quiz for secondary schools in Cork. Cork Titanic Society always welcomes new members from the city and county and fundraising ideas and enquiries are welcome at 086-0518021. Other officers Breda O’Sullivan, secretary and Paul White, treasurer. next to the existing sculptures and pavement plaque at Penrose Quay. Plans for a memorial stone dedicated to all those lost to water tragedies is at an advanced stage with Cork City Council, while a fleet of magnificent models of ships including Titanic, the Lusitania and Innisfallen, all of which were crafted by members of the society, will also be going on display throughout the county. One of the most important events will be the erection of a memorial stone in Fitzgerald Park, Cork, dedicated to the memory of all those lost to water tragedies. Plans for the monument with Cork City Council are at an advanced stage. Another event of interest to the public is the Society’s grand fleet of elegant and magnificent ship models including: Titanic, Lusitania, Innisfallen and sailing ships crafted by members of the Society and many more will go on display throughout the city and county. The society is a voluntary organisation and over the years has raised funds for Diabetes Ireland, Cork Simon and other worthy causes. It has helped to provide an RNLI lifeboat for Crosshaven and a fishing boat for a family stricken by the tsunami in Sri Lanka.